Former Texas Gov. Rick Perry, tapped by President-elect Donald Trump to head the Energy Department, said Thursday he regrets his infamous statement about abolishing the federal agency and insisted it performs a critical function. Perry told a Senate committee that if confirmed, he will be a passionate advocate for the department's core missions and will seek to draw "greater attention to the vital role played by the agency," especially in protecting and modernizing the nation's nuclear stockpile. In 2011, at a Republican presidential primary debate, Perry was something of a punchline who famously forgot the department was one of the agencies he wanted to eliminate. Perry also pledged to promote and develop American energy in all forms, advance the department's science and technology mission and carefully dispose of nuclear waste. And he acknowledged that climate change is real. 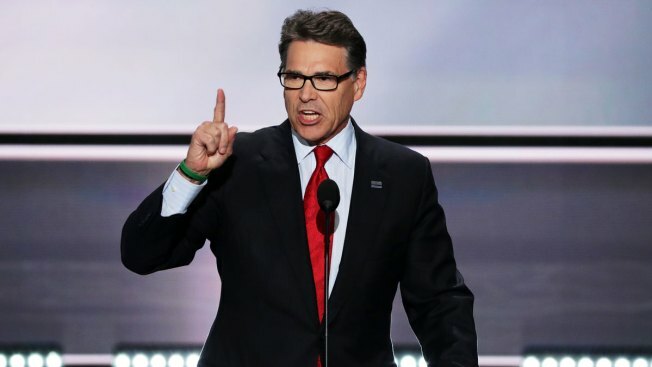 Perry, who served 14 years at Texas governor, said he was for "all of the above" on energy production before President Barack Obama embraced the strategy. Years before the Democratic president endorsed all types of energy production — from oil and gas to renewable sources like wind and solar power — Perry was putting the policy into practice in Texas. Perry also drew laughs when he told Sen. Al Franken, D-Minn., that he enjoyed meeting him at Franken's Senate office, adding: "I hope you are as much fun on the dais as you were on the couch." "I think we found our 'Saturday Night Live' soundbite," Perry joked. Former Texas Gov. 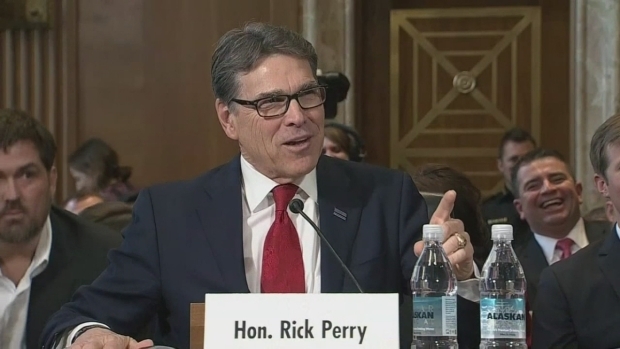 Rick Perry and Minnesota Sen. Al Franken shared an awkward moment during the confirmation hearing Thursday Jan. 19, 2017 for President-elect Donald Trump's nominee to run the Energy Department. Franken was a writer and actor on the show in the 1970s and 1980s. Democratic Sen. Joe Manchin of West Virginia introduced Perry, a rarity for one of Trump's Cabinet selections. Manchin called Perry a successful executive of a state with a diverse energy portfolio and a longtime friend. Perry, 66, left office in 2015 and then launched his second ill-fated bid for the GOP presidential nomination. He was a harsh critic of Trump, even calling the billionaire businessman a "cancer" on conservatism, but later endorsed the Republican nominee. Perry has received support from a surprising source: Moniz, who told reporters that Perry "is very intent on doing a good job." Moniz said last week that he and Perry had discussed the "special role" of the Energy Department's 17 national laboratories, which Moniz called the "backbone" of U.S. science.